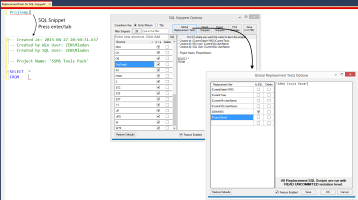 Global Replacement Texts is a feature that lets you put custom keys, which are then replaced by their defined values, in following features: SQL Snippets, CRUD Generator, Run Custom Scripts and New Query Template. All keys have to be surrounded by pipe characters like so: |ReplacementKey|. There are 4 predefined replacements that you can use: |CurrentDateInYMD|, |CurrentTime|, |CurrentWinUserName| and |CurrentSQLUserName|. You can add as many custom ones as you wish. 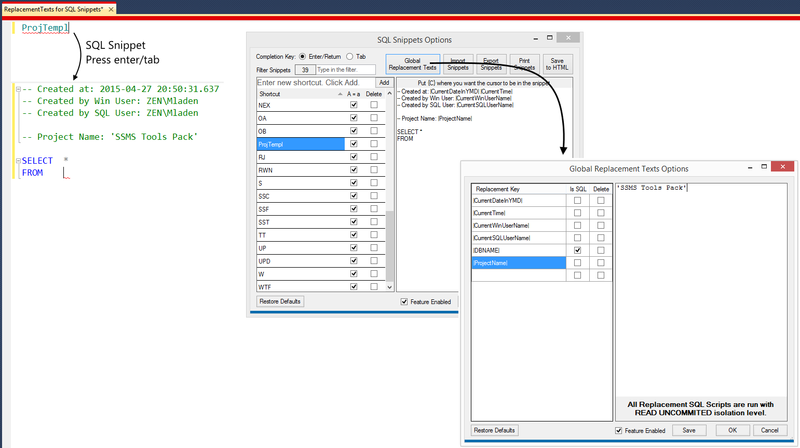 There's also an advanced option where you can set your key's value to be T-SQL script that will execute and replace the key with the value in the first row and column in the returned result set. All T-SQL statements are run under READ UNCOMMITTED isolation level. They are run with the contextually current active connection in SSMS. If there's an error the returned replacement value will say the error happened.